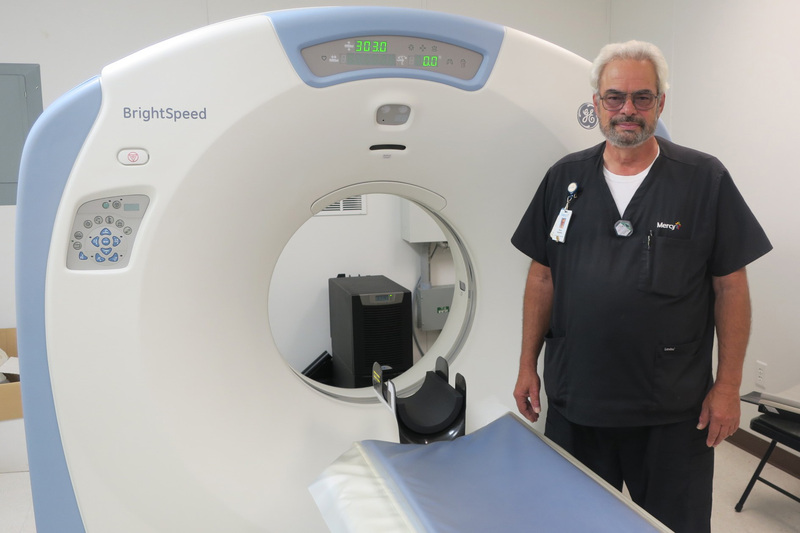 Mercy Health/Love County recently upgraded its CT scanner from a 4 slice scanner to a 16 slice scanner. That high speed reduces the patients’ exposure to x-ray radiation and the amount of time they spend in the unit. The time difference is important, since patients need to hold their breath for the length of the scan. “It took an average of 40-45 seconds for an abdominal scan with the 4 slice CT. With the 16 slice CT we do the test in 15 seconds,” Stephens said. The scanner looks like a large doughnut set on end. During the scan, the patient lies on a bed that slides slowly back and forth beneath the opening of the scanner to allow the scanner to take internal pictures of the body. The new CT scanner takes 16 two-dimensional images – or slices – during each revolution, and each slice is less than a millimeter wide. The system’s computer “stacks” the information from the slices into 3-D images. The CT scans are transmitted electronically to a radiologist in Ardmore for interpretation. Results are delivered within 24 hours. Emergency reads can be accomplished within 30 minutes for trauma patients in the emergency room. The equipment, Stephens said, is used mainly to look at internal injuries, such as a torn kidney, spleen, or liver; or bony injuries in the spine. The technologists also scan for tumors, aneurysms, and bleeding. This is the third CT scanner acquired by Mercy Health/Love County in 10 years. The hospital acquired a single slice scanner in fall 2007, upgraded to a 4-slice scanner in 2008, and replaced that unit with the 16-slice CT scanner in May 2018. Before CT scanners were invented in 1974, the types of information they provided often could have been discovered only by exploratory surgery.